Civil War Bullets from the Battle of Antietam – The Battle of Antietam also known as the Battle of Sharpsburg, was fought on Wednesday, September 17, 1862, near Sharpsburg, Maryland, and Antietam Creek, as part of the Maryland Campaign. It was the first major battle in the American Civil War to take place on Union soil. It remains the bloodiest single-day battle in American history, with 22,717 dead, wounded, and missing on both sides combined. During the battle, Union Army Maj. Gen. George B. McClellan was able to halt Confederate General Robert E. Lee's invasion of Maryland, but Lee was able to withdraw his army back to Virginia without interference from the cautious McClellan. Although the battle was tactically inconclusive, the Confederate troops had withdrawn first from the battlefield, making it, in military terms, a Union victory. Two dropped (unfired) 0.58 caliber bullets are owned. The bullets were previously part of the Wentworth Military Academy Collection. 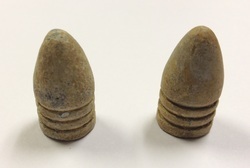 The bullet pictured on the left was identified as having been found at Bloody Lane on the Antietam Battlefield in August, 1954. The bullet pictured on the right was identified as having been found near Dunker Church on the Antietam Battlefield in August, 1955.